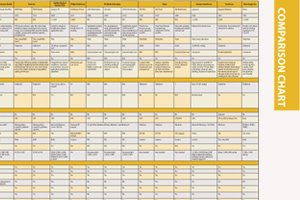 This article appeared as an introduction to a Comparison Chart on Treatment Planning Systems in the July/August 2014 issue. Although the fundamental workflow has not changed for treatment planning systems over the years, as technology improves, new features are added to enhance workflow and function. • Workforce and training constraints — more features have been added to treatment planning systems to pave the way for more possibilities in treatment, but the process still needs to be streamlined. The following overview helps paint a picture of some of the software systems currently available on the treatment planning systems market. Brainlab’s iPlan RT treatment planning offers efficient clinical workflows and provides more treatment options for clinicians to choose from. Its image features offer time-saving pre-planning steps, such as automatic image fusion and fast organ definition and contouring. The software caters to a wide spectrum of treatment techniques to help define the best possible treatment plan. The Brainlab Monte Carlo Dose Calculation software is a high-performance algorithm designed for fast, precise radiation therapy dose calculations. Brainlab technology currently powers treatments in the fields of neurosurgery, radiation oncology, orthopedics, ENT, CMF, spine and trauma. Elekta’s XiO is a comprehensive 3-D intensity modulated radiation therapy (IMRT) treatment planning platform that combines advanced planning tools with well-rounded dose calculation algorithms. It supports a range of treatment modalities, including 2-D, 3-D, MLC-based IMRT, solid compensator-based IMRT and brachytherapy, in addition to dynamic conformal arc therapy and stereotactic delivery. The platform offers advanced dose calculation algorithms, including Clarkson, FFT Convolution, MultiGrid Superposition, Fast Superposition and Electron Monte Carlo. Clinicians can choose the algorithm that is most appropriate for each plan. The software helps simplify planning with user-definable templates, calculation grids and workspace. Monaco 5, the latest version of Elekta’s Monaco treatment planning system, has received 510(k) clearance from the U.S. Food and Drug Administration (FDA). It now supports the full spectrum of radiotherapy techniques, including VMAT, IMRT and 3-D conformal radiation therapy. The system is especially well equipped for sophisticated stereotactic therapies, such as SRS and SRT, with added planning support for specialized beam shaping solutions, including circular cones. The new version employs the Monte Carlo dose engine, considered the gold standard for calculating radiation dose. Philips’ Pinnacle³ is designed for small and mid-size centers as an affordable server-class system that provides access from virtually any location. The system is scalable so it can grow with a center’s needs. It can support centers with up to three linear accelerators (linac). Centralized processing offers all users the power of the professional server. The system is up to 30 percent faster than the older 810X platform. Floating licenses allow a Pinnacle³ user to have unlimited number of access points, including Mac users. RaySearch received FDA 510(k) clearance for the extended version of its treatment planning system, RayStation 4.0, in May, having received its CE mark in December 2013. The new version contains tools for optimization of proton treatments using the pencil beam scanning (PBS) technique. Proton therapy is considered the most advanced form of radiation therapy due to its superior dose distribution and fewer side effects. Protons deposit the majority of their energy within a precisely controlled range, making it easier to target the tumor and spare healthy surrounding tissue. PBS is the most sophisticated technique to deliver proton therapy. It enables intensity-modulated proton therapy (IMPT) that allows clinicians to target a cancerous tumor by controlling both the intensity and the spatial distribution with millimeter precision. The proton module in RayStation contains all the state-of-the-art tools needed for PBS such as multiple field optimization, single-field uniform dose and distal edge tracking techniques. Varian’s Eclipse treatment planning system allows for efficiency. Virtual simulation eliminates data transfer steps and the management of separate sets of data. Emergency treatments can be planned immediately in the simulation area. Powerful tools simplify contouring tasks and field setup, and a fast calculation engine reduces treatment planning time. Integrated plan verification and quality assurance tools speed ongoing treatment planning and beam data validation, saving time for physicists. The integration of advanced image processing and analysis will continue to expand as treatment planning systems evolve. As the process becomes more streamlined, doors will open to more possibilities in treatment.